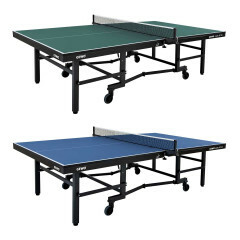 The GEWO table Gewomatic SC 25 is a high-quality table tennis of the extra class. A world class table tennis for world class players. The Gewomatic SC 25 corresponds to class A of the European standard 14468-1. This model also complies with the ITTF approval criteria. Durable, compact, stable and robust. Competitive with a 25mm thick high-performance surface. First-class play-characteristics and compact stowage dimensions 1,520 x 1,600 x 560 mm (L-B-H). 100% pre-assembly at the factory. Only remove packaging and start playing immediately. Approved for the operation of the ITTF and the DTTB. Gewo Table Gewomatic SC 25 is beeing added to cart.